Did you know that the facial nerve inserts into the ear, where it connects with the stirrup via the stapedius muscle, the smallest and hardiest muscle in the body? Did you also know that the face reflects what is going on in the ear, or, to put it another way, that there is a particular 'look' to the fully opened ear? I learned this—among many other things—from Paul Madaule, the director of the Listening Centre in Toronto. And what is a fully opened ear? An ear that is listening to a wide range of frequencies—from top to bottom. The first time I met Paul was at a workshop at Westminster Choir College a little more than a decade ago. At lunch, after his morning lecture, I asked him what great listening looked like, and I've never forgotten his answer. 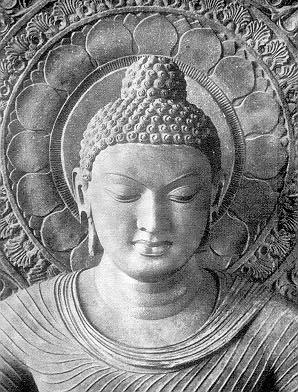 He said that an open ear was mirrored by an open face, and was clearly expressed in images of the Buddha, with his half smile and facial muscles drawn towards the crown of the head—this expression indicating a particular orientation of the stapedius muscle towards high frequencies. I 'got it' in a flash and remembered—no lie—Manuel García's treatise as well as that of earlier pedagogues. To a man (Emma Seiler may be the first woman to write a treatise on singing), they note the opening of the mouth as being towards a smile. Is it possible to obtain this position of the mouth and for the ear to be closed? Of course. You know this look well. You see it when you meet someone and they 'smile' at you but their eyes are saying something else. This goes back to what I wrote about the facial muscles of the ear having a connection to the inner ear. The whole face—nay the whole body—participates. Here are some of the indications that the ear is open in terms of singing. The upper lip widens and becomes active. If rigid, pulled down or inflexible, this indicates that the muscles of the ear (there is another one—the tensor tympanum—behind the eardrum) are not working optimally. The grooves between the upper lip and the cheeks become prominent. The cheeks - even the entire face- appear to be sculpted. This is prevented if the risorius muscles are engaged. And if they are, the singer is - effectively- driving with the brakes on. The spine elongates. The ribcage expands. The lower jaw opens and retracts without grimacing. The breath is full, calm and unlabored. The ears lift. The greater the intensity of vowel, the more they move. The tongue lies down, and may be seen to groove on [a]. The lips extend forward on closed vowels and various sibilants. Did you also know that the canny voice teacher is able to see what the singer is going to sound like the moment he/she takes a breath? However, that same teacher is kidding himself if he thinks he can impose 'correct' movements mechanically, and in doing so, open the student's ear. Better to provide an excellent model in exploring the nature of sounds and train the student's listening faculty until they appear. In sum: my conversation with Paul got me wandering if—in essence—García was describing an essential characteristic of the open ear. That was interessting, because I never thougt of Buddha's statues this way and now I finally have a visual to follow! Thanks for sharing this idea! One note however...What I find very visible in Buddha and very important in this whole thing is the cheecks. There are these zygomatic muscles in the face, and the muscles under eyes. And in fact to me it seems for them to be the only true reason between the fake smile (so often seen on TV) and a real start of a smile. In fact if one observes a happy moment, it starts at the cheecks and under the eyes. And lips somehow then naturally come to this position. Fake smile is so often seen on TV, politics and singers who try to get something trough it. With the difference that they all strech the mouth. And there is nothing worse then seeing a person smile at you with this streched mouth, relaxed rest of the face position. Just like there isn't anything worse than hearing a singer sing a tone with this streched mouth and dead face position. And I'm quite sure that was something what Marchesi wrote she was against as well. In quite a few books, and well, many many teachers, they recommend the smelling a rose visual to get the Buddha-face and it really does the half-smile effect, but on the whole face, not the mouth themselves. HI DInko- Thanks for your comment. I agree: the zygomatic muscles are a key feature of the open face and are present in a the 'start of a smile." You make an excellent point re stretching the mouth. I would add- in terms of singing- that this stretching does not open the ear! Hi! No, thank you for writting your informative blog! =) Yes that is true and important as well!